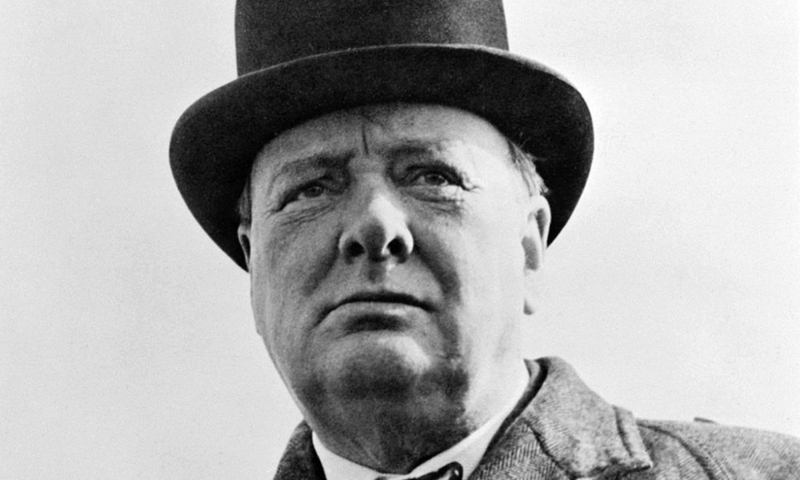 The University bestowed an honorary doctor of laws degree upon British Prime Minister Winston Churchill in 1941. The University has a proud past of commencement speakers and honorees but the 91st commencement ceremony on June 16, 1941, was particularly noteworthy. Eastman Theatre was packed as University President Alan Valentine presented an honorary doctor of laws degree to British Prime Minister Winston Churchill, who accepted the honor from London through a trans-Atlantic radio address that urged for Anglo-American unity in the fight against the Nazis. 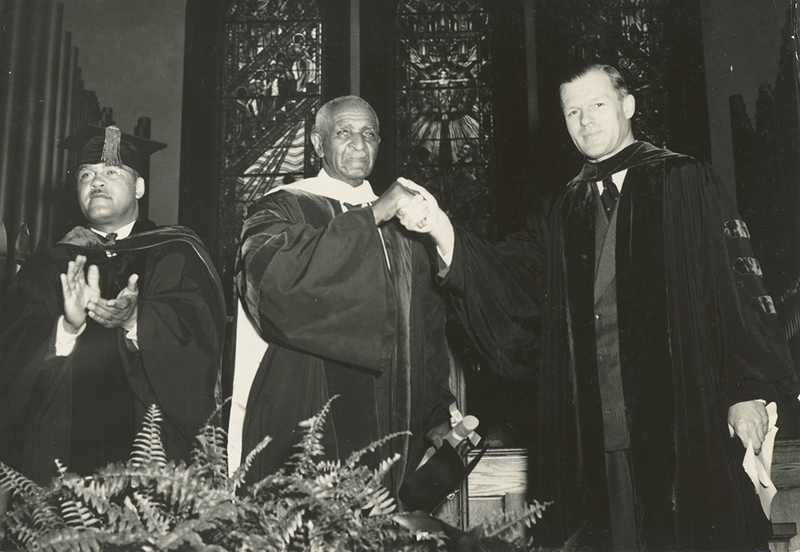 Noted scientist George Washington Carver was also honored in absentia during the 1941 commencement ceremony. “United we stand. Divided we fall. Divided the dark ages return. United we can save and guide the world,” Churchill said to close his dramatic 10-minute address, which was broadcast by WHAM radio in Rochester in partnership with NBC radio and the BBC—and took several months to coordinate. “An enthusiastic audience applauded the remarks for quite as long as the incomparable Briton had spoken,” notes Arthur J. May in The History of the University of Rochester 1850–1962. 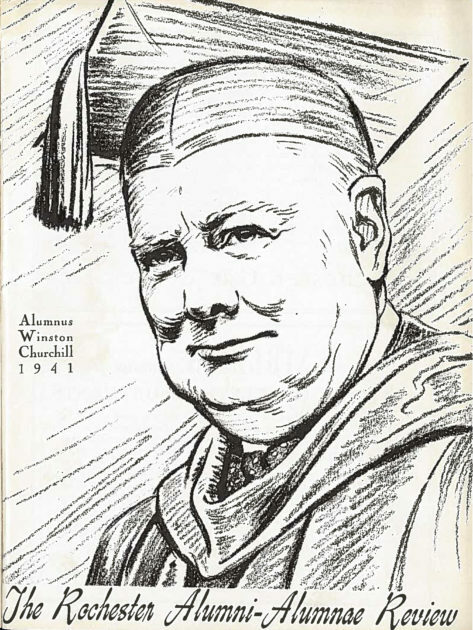 An excerpt from an article in the June-July 1941 edition of Rochester Review, headlined “Commencement Rites Span Atlantic as Winston Churchill Gets Degree,” describes the historic event. “Members of the Class of 1941 will probably remember their Commencement day for many years to come. For the first time in the history of Rochester, and probably for the first time anywhere, the trans-Atlantic radio was invoked to bring together, vocally at least, the recipient of an honorary degree and its donor, Winston Churchill, Britain’s prime minister, in historic Downing Street, London, listened while Alan Valentine, University of Rochester president, cited him as the “symbol of Britain aroused—stout in heart, direct in speech, cheerful in reverses, calm in confusion.” Millions of Americans and Britishers heard the president’s words, and heard too the ringing phrases of Prime Minister Churchill’s reply. It was Winston Churchill’s first speech prepared exclusively for American consumption since he took the reins from the faltering Chamberlain. It was a shrewd speech, obviously written by a man who understands Americans thoroughly. He recalled that his grandfather, Leonard Jerome, had lived in Rochester, and had published a newspaper here, even though he forgot that the newspaper was The Rochester American and not The Plain Dealer. There was in his address the assured British confidence in ultimate British victory. There was, also, an appeal for American assistance in lessening “the length and the perils of the journey that will have to be made.” He reminded Americans that one united gesture by the peoples that now lie crushed by the Axis would, if made in time, have halted the dictators. They did not act together, so they fell separately, under the impact of “brutal violence, poison from within, subtle intrigue.” He ended his ten-minute address with the significant challenge that “United we stand. Divided we fall. Divided the Dark ages return. United we can save and guide the world.” And there was little question but that his “we” included not only Britain and her dominions—“the old lion with lion cubs at her side—” but the United States as well. The Eastman Theater was crowded with spectators, although the plan to award a degree to Prime Minister Churchill, across 3,000 miles of the Atlantic had been announced only the day before. The secret has been well kept. There had been vague whispers that an additional honorary degree would be given, probably in absentia, at the Commencement ceremonies, but only a handful of University officials knew of the project until it was revealed to the Board of Trustees at its meeting on Saturday, two days before the event. “If the degree to Churchill was the most memorable the U. of R. had ever granted, a second worthy of note was also bestowed in 1941 on George Washington Carver,” writes Arthur J. May in The History of the University of Rochester 1850–1962. Carver, who led the agricultural department at the Tuskegee Institute for nearly 20 years, was known for his research and innovative educational programs and for the development of a variety of uses for crops such as cow peas, sweet potatoes, and peanuts. Illness prevented Carver from receiving the honorary doctor of science degree in Rochester so Valentine flew to Alabama to present the diploma. Also receiving honorary degrees in 1941: Robert Patterson, undersecretary of war, who delivered the Commencement address; Eve Curie, daughter of Marie and Pierre Curie; Warren Longcope, physician-in-chief at Johns Hopkins University; Rene Jules DuBos of the Rockefeller Institute for Medical Research; Mary Gannett, a social activist in Rochester; and Frederick Stock, director of the Chicago Symphony Orchestra. 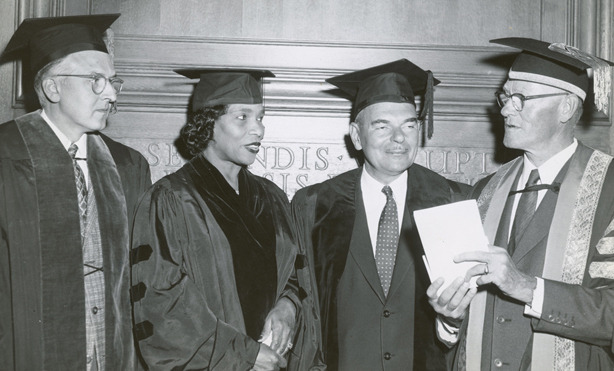 1957: President Cornelis de Kiewiet (right) talks with honorary degree recipients (from left) Willard M. Allen ’32M (MD), famed singer Marian Anderson, and former New York governor and two-time presidential candidate Thomas E. Dewey, who presented the commencement address. The practice of having an outside commencement speaker at the University began sometime in the early 20th century. During the 1970s and 80s, speeches came from recipients of honorary degrees. In the late 1980s, the practice of having a commencement address was revived, although the address was typically given near the end or middle of the ceremony instead of at the beginning. See a list of select speakers and honorary degree recipients from commencement ceremonies over the years.